This post is sponsored by GreekU, however as always all opinions are my own. Thank you for supporting the brands that support The Classic Brunette! Those who have been following TCB for a while may remember that I was in a sorority in college! Although I graduated, I still like to support my sorority by rocking my letters, however out in the post-grad world, it isn't always acceptable to rock head-to-toe greek letters. A sorority's letters are a source of pride for many girls, because they often represent your and your sisterhood's values. They're something to be respected and should be worn in a way that makes you proud! Well, at least you should think this way after you graduate, before that you can wear them in practically any way as long as you're doing good PR for your sisterhood! There are so many pieces in my closet with Alpha Gamma Delta's (my sorority!) letters on them including everything from t-shirts (LOTS of t-shirts), hats, mugs, hair ties, etc. I love to try to incorporate these items into my wardrobe tastefully as possible without looking like I am desperately clinging on to my college years. 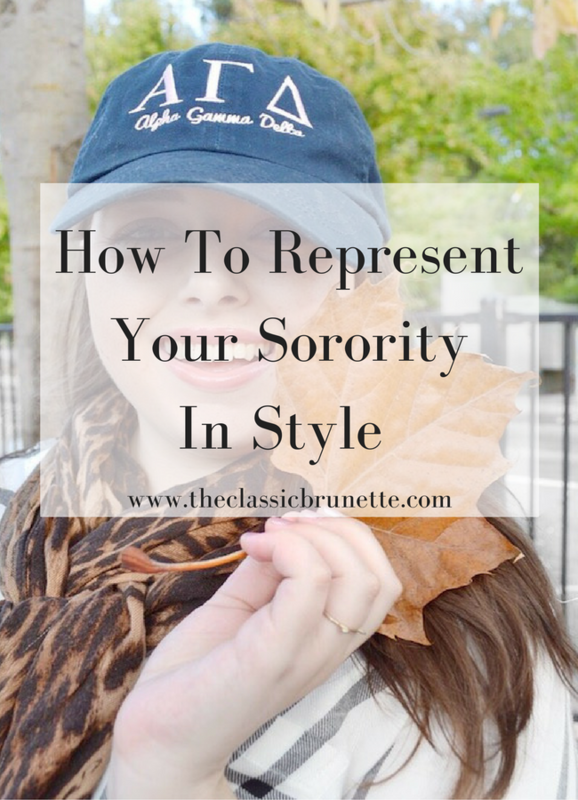 😂 I wanted to share a few of my tips for all you college girls and grads on how to wear your sorority gear with style! Let's start with my best piece of overall advice: Only wear one item at a time! I know in school it's totally fine to wear a tank with letters underneath a greek letter sweatshirt and even a pair of sweatpants with your letters, and I hate to break it to you, but most people might look at you like you're crazy if you dress like that outside of campus. In order to not look like a crazy sorority obsessed person, I recommend wearing one statement piece in an outfit. That could mean a hat, a shirt, a tote, anything! The only exception for this rule is jewelry. I think it's completely fine to wear a ring, a necklace and a bracelet with your letters on them all at the same time, even along with your other designated 'statement' piece. (As long as they aren't completely obnoxious!) If you're looking for some great jewelry options, I'm loving this ring and this necklace from GreekU, so classic! I also know a lot of girls who didn't always like to represent their sorority with their clothes and accessories, but showed their pride in other ways. Always on the go and needing coffee? Grab a tumbler with your letters on it! Don't like anything too flashy, but still want to show off your letters on campus everyday? Add subtle letters to your backpack! Think about incorporating your sorority into your everyday life in different ways. My favorite way to do this is by using a phone case with my letters. My last piece of advice for staying fashionable while representing your greek allegiance is simple, go with the trends. Although t-shirts are probably my least favorite stylish way to rep Alpha Gam, I have so many of them that it would be pure waste to never wear them. Now don't get me wrong, I think there are so many great looking sorority t-shirts out there, however pairing them with sweatpants, leggings, and moccasins isn't exactly fashionable. 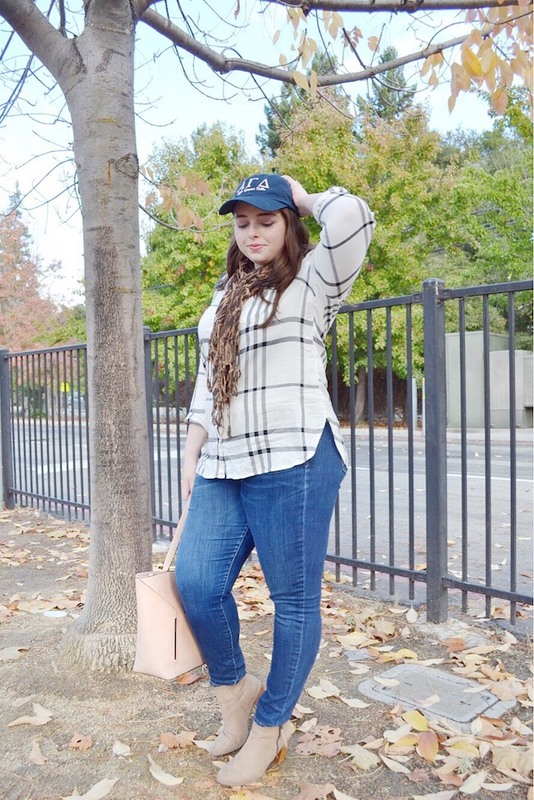 I think wearing a cute sorority top tucked into a trendy button up skirt or distressed denim with a great pair of boots creates a great outfit. Much better than the "I just threw this on because it was comfortable" look that I saw all the time on my college campus. If you're looking for a great place to stock up on some great greek apparel and accessories, GreekU is definitely the place to go! Were you in a sorority during college? 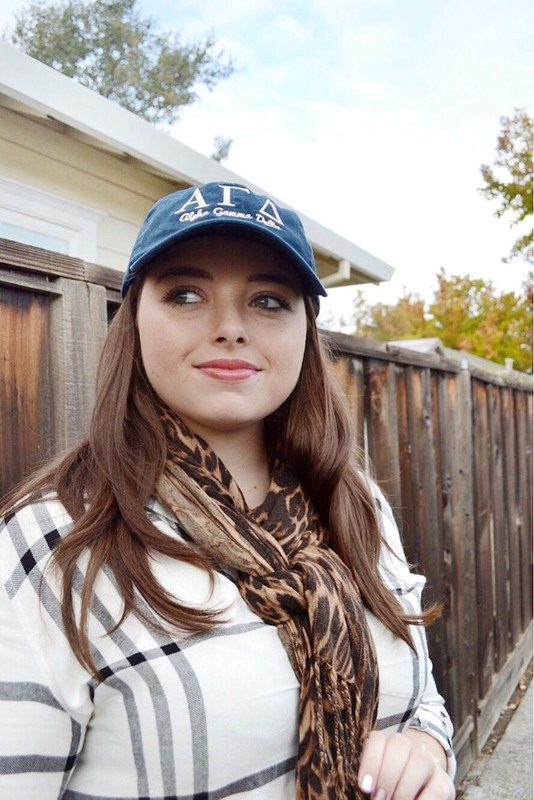 What are your favorite ways to wear your sorority letters? I love the styling! Sorority isn't something we do where I'm from, but it sounds pretty cool. these are great tips! I actually quit my sorority and had to give back my letters! I live in a college town that has my sorority, so I get a lot of looks if I wear my letters! No regrets though, my tshirts are so comfortable! I'm defs into my sorority a lot for being an alumni, and I would LOVE to have a hat like this lol. I love wearing a hat with my letters. simple, easy and classic! This is soo cute! I love how you styled this look! My little sister is a freshman in college and she just joined a sorority and she LOVES it. It's so cute - I need to show her this! If you do it right, being a sorority woman is a lifetime commitment! I initiated with Kappa Kappa Gamma in 2006, and now I'm the Public Relations Specialist for two districts. I love being so involved with Kappa! Greek U has super-cute stuff--they sent me a floral tee with my letters on it. It's sooooo soft! 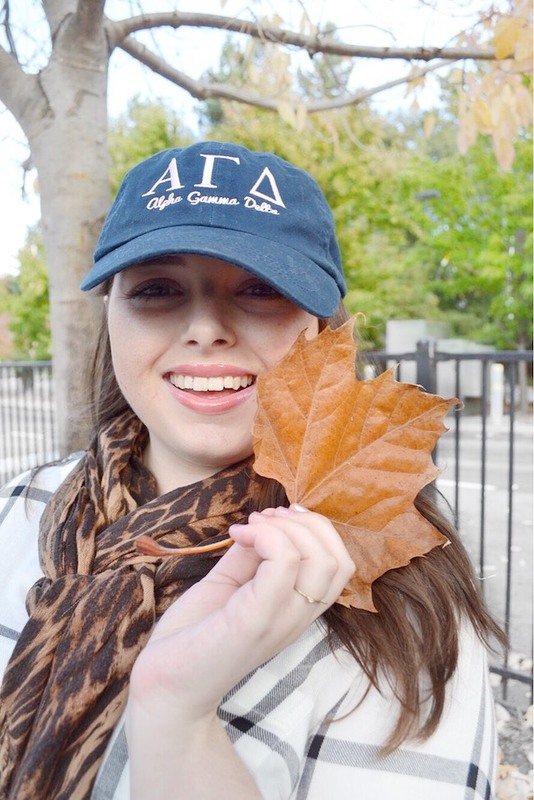 Cute, your AGD hat is a fun way to show your sorority spirit with your cute fall outfit! Cute! I rushed a sorority in college but ended up deciding it wasn't for me. Glad you enjoyed yours so much though! We didn't really have sororities at my college-so no repping for me! I love this look though! this is nice! We dont do sororities here so i dont have to rep anytjing but that ios a fun hat! I had wanted to be a part of sorority life when I was in college but it didnt work out.. but this look is so cute on you! So cute, girl! Loving the hat.